We carry a wide variety of plants and containers for purchase at our shop. Come visit us, pick out a plant, let us pot it up for you and send you on your way with some instructions on how to care for your new plant friend! If you have a pot you love, bring it in and we’ll help you outfit it with a new plant. 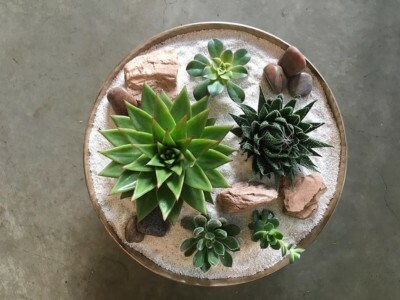 There is 10-20% fee for custom potting in our shop. If your looking to incorporate plants into your office or home and need help with selection, care and placement we can help! Our collaborative process is about getting to know you, your home/office, style and how much time you have to care for your plants. If you are interested in setting up a plant maintenance program, please see below for more details. We provide complimentary on-site consultations for businesses and residences in the 98101, 98102, 98109 & 98121 zip codes. Please contact us for rates outside of these zip codes. After our consultation we will provide you with an estimate via email within 2 weeks of our meeting. This will line item your needs as well as explain our on site labor and delivery costs. Because our estimates are a la carte, you can pick and choose to do the whole package, parts of it or to complete it in stages. Plant maintenance programs can be included in your estimate upon request. After we have completed your installation, we will send you a copy of care instructions for your plants. If you are interested in a plant maintenance program please let us know and we will add it to your estimate. There is a separate contract for plant maintenance programs that commence after installation. Pricing varies based on how many and what type of plants you have. In order to start your order with us we require a signed contract and a 25% non-refundable deposit. The balance of your bill is due 5 business days before your installation. Plant Maintenance is billed monthly to a re-recurring credit card. If you opt out of our plant maintenance program, we will provide you with care instructions for your new plant babies! We are not responsible for the lifespan of your plants after they leave our care if you are not on our maintenance program. Plants are not refundable. Let us bring our shop, expertise and unique containers to you! We can create a pop up plant shop for your office or event. Please contact us here to inquire about pricing and availability.